Nepal's Maoist party has ended an indefinite strike after six days saying it was taking a heavy toll on ordinary people. Party leader Pushpa Kamal Dahal said the Maoists would continue with other forms of protest. The former rebel group has staged demonstrations and brought the country to a virtual standstill, in an attempt to force the government to resign. Transport, schools and businesses have been closed and tourists evacuated. "We have decided to end the strike keeping in mind the difficulties the general people have had to face," Mr Dahal said on Friday. Thousands of Maoists have been out on the streets since Sunday, protesting against the government led by Prime Minister Madhav Kumar Nepal. On Friday riot police used tear gas to disperse crowds. Maoist leader Baburam Bhattarai said the protests were not over, but that they had "changed the form of process" of their movement. "Over [the] week we launched political strike, government responded. But the government turned the masses against the masses," he told the BBC's Joanna Jolly. Also on Friday, about 20,000 people took part in a protest against the Maoists in Kathmandu. Kush Kumar Joshi, organiser of the rally and head of Nepal's chambers of commerce, told AFP news agency the strike was "crippling the business industry". Mr Dahal was elected as prime minister in 2008 but resigned last year in a dispute over a failed attempt to sack the army chief. The Maoists, who are the largest party in parliament, are demanding Mr Nepal steps down and that their party lead a national unity government. 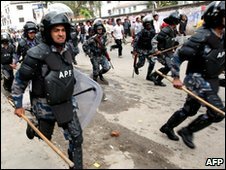 They say the government has not consolidated Nepal's peace process and has failed to draft a new constitution - due by 28 May.